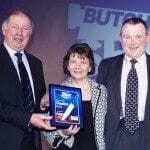 Rob Rattray Butchers were proud to be one of three finalists from Wales in the Butchers Shop of the Year Awards 2012. The presentation wasmade by Mr Dai Davies of Hybu Cig Cymru at the Landmark Hotel, london on 22nd November 2012. Judge Fred A’Court said “This is an excellent business that is an asset to Aberystwyth. Rob has a warm, welcoming, easy going manner that personifies the traditional Welsh butcher. He is not only using his big hearted personality to welcome customers into his own shop but also his butchery and farming skills to assist the wider Welsh food and farming industries in achieving their full potential”.